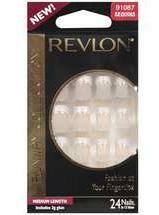 Revlon have just launched a great new line of artificial nails that will bring catwalk glamour to your fingers! The Runway Collection features pale pink nails with detailing on the ends, ranging from black stripes to purple with diamantes to The kit has everything you need – 24 nails in 12 sizes, a nail file, manicure stick, and of course the all important glue. Along with false eyelashes, fake nails are also seeing a recent surge, as people choose to go down the do-it-yourself route rather than splash out in salons. The Revlon nails will last 7-10 days, as long as you’re careful not to get any air bubbles trapped in them, and have an elegant, professional look to them. They’re available in Boots now. Ditch The Black Eyeliner For Blue Win Tickets to 10 Years Younger Live!